This sweet and savory creation from chef Jamie Malone takes this classic French pastry to new heights. In case you missed it, yesterday we announced the Food & Wine Restaurants of the Year for 2018, and along with this groundbreaking crop of restaurants comes 24 epic recipes to help you bring the magic of these special restaurants home with you. 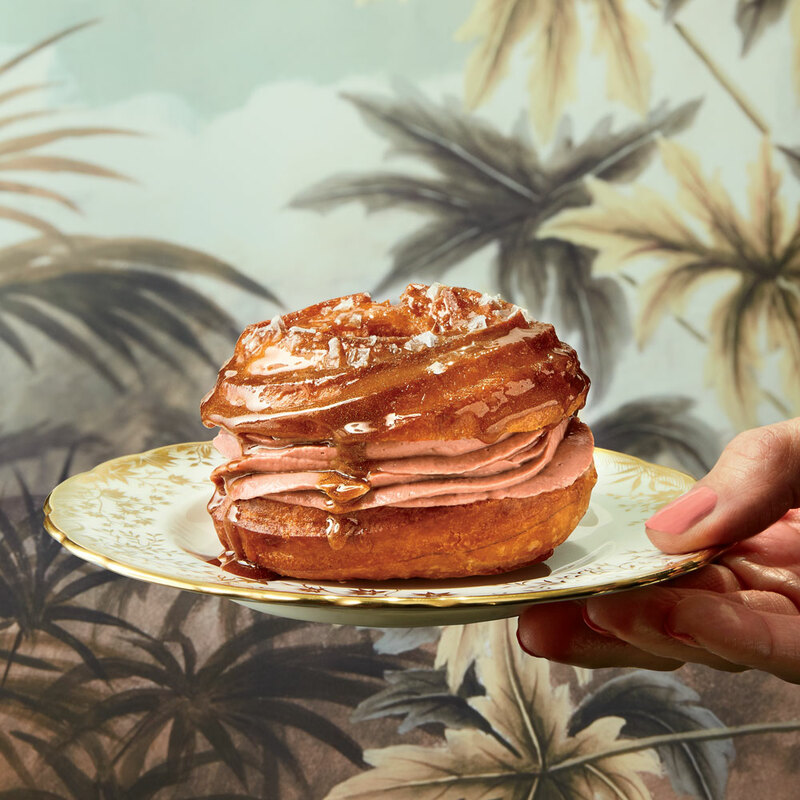 And although it's impossible to pick a favorite dish, we crowned one as the Dish of the Year, thanks to its ingenuity and sheer deliciousness: Jamie Malone's chicken liver Paris-Brest, found at the Grand Cafe in Minneapolis. Dipped in a burnt honey glaze glistening with shimmer powder, the sweet and savory pastry literally sparkles. For a moment, you might consider it too beautiful to eat—until you realize it's one of the most enlightening bites of food you might have all year. Take it from Food & Wine culinary director Justin Chappel and restaurant editor Jordana Rothman, who made the dish in the Test Kitchen yesterday. We're live with Justin Chapple and Jordana Rothman to cook the cover of our May issue and talk about our 2018 Restaurants of the year! If you fancy yourself a baker, a tastemaker, or really just a food lover, we suggest you take the Dish of the Year and run with it. Watch the video above for pointers as you're making the recipe. And don't be put off by making the choux. Consider it a bonus that you can work on your choux skills and get this perfect object in the process. Rothman describes the dish as Beyonce singing La Vie en Rose, which, if you weren't already convinced, should get you in gear to try out this dish at home, or seek it out at the Grand Cafe. When you're making the choux, you'll bring water and butter to a boil before adding flour. Be sure to add the flour to the mixture as soon as it comes to a boil. Don't let it sit on the stove for a while, or else the water will evaporate, throwing off the ratio for the dough. Chapple also advises that you add the eggs one at a time. That's because not all eggs are the same size, and achieving the right consistency is critical for choux. Traditionally, this would be done by hand, but Malone uses a stand mixer for this recipe. So keep a careful eye as you add eggs, one by one, and look out for those telltale signs that the dough is ready: It should be thick, glossy and stretchy, but not too wet. Also, be aware that you're going for a slightly thicker choux here, Chapple points out. That's because you want it to really maintain its beautiful ridges. When you're piping the dough, make sure to leave a large enough hole in the center. Rothman explains that the original Paris-Brest was invented to promote a bicycle race in France in the 1890s—the shape meant to mimic bicycle wheels. So make sure you leave about 3/4 to 1 inch of space. Once you've made the choux, you'll make the chicken liver. Be sure to chill it before piping it onto the choux (that's a step you can't skip), or else you'll be left with a mess. And when you're making the burnt honey glaze, don't forget the glitter. It's luster dust, an edible gold dust used in baking, and it takes this already fabulous dessert to the next level. Finally, eat this thing of beauty with your hands. “Like a lot of delicious things, this makes a little bit of a hot mess when you eat it,” Rothman warns. So just go for it.